Facebook made an accounting loss of £28.5m in Britain in 2014, after paying out more than £35m to its 362 staff in a share bonus scheme, according to the unit’s latest published accounts. 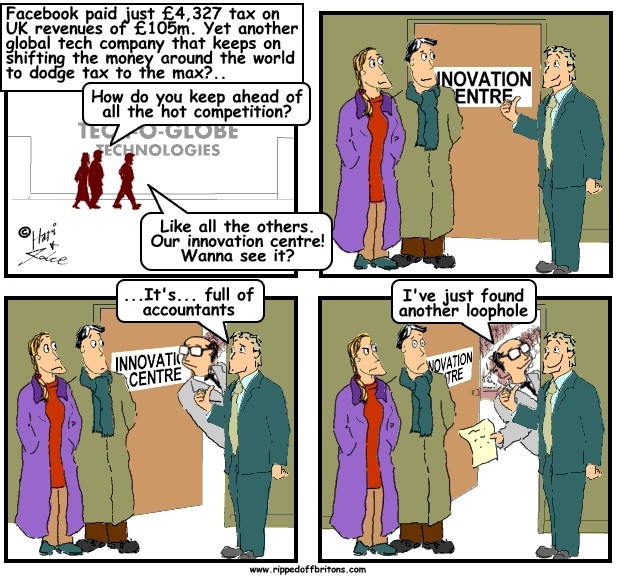 Operating at a loss meant that Facebook was able to pay less than £5,000 in corporation tax to HM Revenue for the year. The level of tax contribution by Facebook, which claimed in 2013 that at least a third of UK adults visited its site every day, will add to the debate about how to ensure that multinationals make fair tax payments in each country in which they operate. Last year, Facebook made a profit on its worldwide operations of $2.9bn (£1.9bn), on revenue of $12.5bn. UK revenues were £105m last year. John Christensen, the director of campaign group the Tax Justice Network, said: “it’s very likely they’re using all the usual techniques to shift profits around.” George Osborne, the chancellor, has pledged to crack down on tax avoidance by global firms by swiftly legislating to enact a new set of rules drafted by the Paris-based Organisation for Economic Co-operation and Development (OECD), which has become a hub for global tax reform in recent years. The so-called BEPS rules are aimed at cracking down on “base erosion and profit-shifting”: the practices used by many global firms to minimise their tax liabilities by recording profits in low-tax jurisdictions. “Taxes should be paid where profits are made,” Osborne tweeted from the International Monetary Fund’s annual meetings last week. Separately, the chancellor has introduced a diverted profits tax, known as the “Google tax”, aimed at preventing hi-tech international firms from minimising their tax liabilities in the UK.